What a way to march our way on to Battleground! The WWE was in Chicago for Raw and The Beast was back! 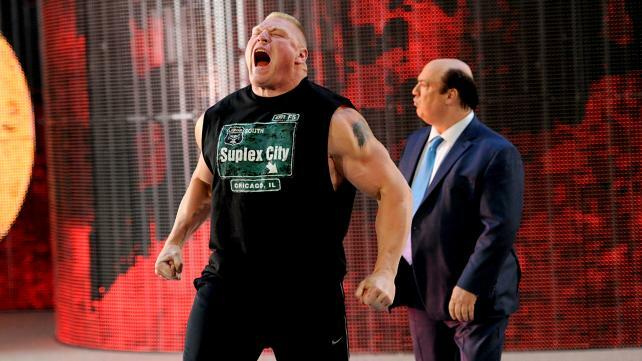 Along with his advocate, Paul Heyman, Brock Lesnar made his presence felt. The night also saw an incredible United States Championship match that tore down the house. It’s always a great show when ever the Windy City is invaded. Did you miss it? Find Out what happened now!! The evening began full force as the conqueror arrived before the WWE Universe. Hot off of destroying the New Day at the Beast in the Eat live event in Tokyo (which can be seen on the WWE Network), Brock Lesnar was ready to go. Always a man of few words, The Beast paced around as his advocate, Paul Heyman did the talking for him. But Heyman was not finished. He also promised that while Battleground was in a couple weeks, Rollins and his cohorts would be visiting Suplex City that night! For the 11th commandment was in full effect and punishment would be swift. Thou Shalt Not Provoke the Beast. First match of the night saw Intercontinental Champion, Ryback, go head to head once more with the Big Show. And once again, The Miz was ringside for all the action. The match itself was something we’ve all seen before. What made it really stand out was the Hollywood A Lister cheering on each of the larger men to beat the other down. Who ever happened to have the upper hand got the cheers. At times the Miz would get a bit excited and find himself on the ring apron, only to be chased off. In the end, the match ended in a DQ because as the Miz could not help himself. It appeared both men were down for the count when he rushed into the ring and attacked the Big Show and then turned and attacked Ryback. But the World’s largest athlete did not stay down and soon Miz found himself in the middle. A giant on one side and Ryback on the other. At first Miz tried to make the two larger men see reason, that they should wait for Battleground. When that fell on deaf ears, he then attempted to appeal to Ryback’s since of logic and understanding as he tried to convince the hungriest man in the WWE to team up with him to take out the Big Show. These pleas again fell on deaf ears as Ryback delivered a Shell Shock to the former Intercontinental champion. But Ryback was not finished as he then delivered a meat hook clothesline to the Big Show before heading back to the back. Again the match itself wasn’t anything to shake a stick at. It wasn’t bad but it wasn’t stellar either. The actions of the Miz are what kept me invested in the match. Of course, he got a bit carried away and cocky and got caught in a place he did NOT want to be in. It is apparent that he is the odd man out when it comes to strength and size, but he has something neither man he is facing at Battleground has, a brain capable of higher thought. There is a solid strategy in letting the two larger men beat one another down and then coming up to pick the bones. If it results in a championship, that is all that matters. Paige’s crusade against the Bellas continued as she took on Brie Bella in singles action. And she was owning one of the resident Queen Bees as she held on to the offensive momentum for most of the match. There was a moment when it looked favorible for Brie, but she missed a second rope drop kick and landed flat on the mat. However, it was a distraction form both Nikki and Alicia that allowed Brie to pick up the win with a face buster. After the match Alicia hit a scissors kick and Nikki hit the Rack Attack. Once again Paige ultimately fell to the might of the Bella Empire. No one is willing to stand with her against the established dominance of the Bellas. So here is what is gonna happen. Sure none of the current Diva’s are willing, but what about the ladies who Paige ran with in NXT? What better way to say out with the old regime, and in with the new? Business was just getting started as Sheamus took on Roman Reigns. This match was a physical treat that anyone could get behind. Both men beat the living day lights out of one another but it was Roman who looked to have the edge on Mr. Money in the Bank. He had the Celtic Warrior reeling when the lights went out. A figure who appeared to be Bray Wyatt appeaered and began to make his way down to the ring. 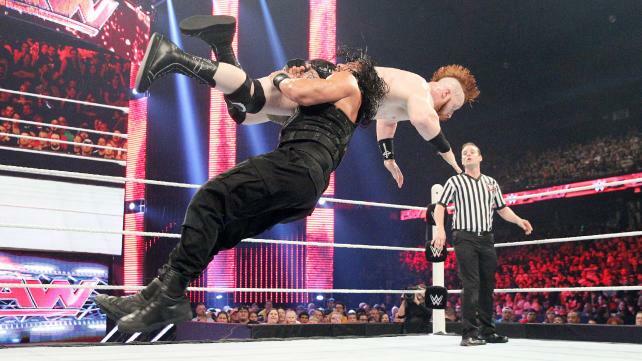 Reigns, blinded by his need for retribution on the New Face of Fear, left the ring and attacked. However it was soon discovered not to be Wyatt after all! This blunder would cost the Powerhouse the match via count out. As Roman left, once again losing a match thanks to Wyatt (anyone but you Roman), Sheamus celebrated his victory. But the celebration was short lived as teh Viper returned triumphantly. Not only did he return but he delivered his signature RKO to the Celtic warrior before posing for the Chicago crowd. So Much to talk about but I will keep it short. The match itself wasa bit of hard hitting fun. But one again nothing to really write about. What does need pointing out is the crowds reaction to Roman. This is Chicago. The place that booed Roman out of the building at Royal Rumble. Yet he enters the building this time to a huge pop. I see band wagoners. Band Wagoners EVERYWHERE! I do love what is happening between Wyatt and Roman. No one talks like Bray does and we are getting to see the angry volcano that we loved about Roman from his days in the Shield. Too long has the WWE Universe been without the Reigns temper. Like Dean Ambrose, I like my Roman Reigns angry! Now with Randy and Sheamus. Still not sure why they don;t like one another but I’m cool that they don’t. The history may be a bit on the weak side but their fights are anything but. So I imagine we will be seeing something at Battleground that let’s us see once and for all who is the beter man between these two. Things are not always what they seem. Dolph Ziggler found this out first hand on Raw. Rusev came down to the ring followed by Summer Rae. He ran down the relationship between Dolph and Lana which brought out Ziggler and the Ravishing Russian. However, as stated, things were not as they seemed as Rusev attacked and eventually revealed that he was all healed up from his injury. Summer Rae dispatched Lana to the floor and the Bulgarian Brute used his crutch to destroy the Show Off. This is a bit on the predictable side but it’s still fun to watch. Sometimes not having to think about what i’m watching is in itself refreshing. You know what’s going to happen so no need to think nor analyze it. Just let it do its thing and enjoy it for what it is. Besides, I can’t wait to see Lana actually in a match. Still bet she’s better than Summer. Short and Sweet. 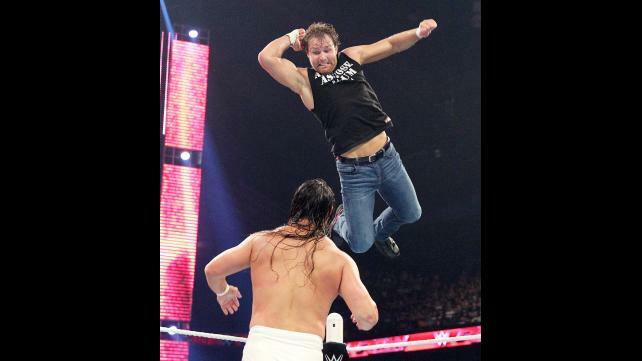 Bo Dallas best be believing in the Lunatic Fringe Dean Ambrose. Not much in the way of a match as Dean easily beat Bo. Sure of course Dallas got in a few good hits but nothing to really celebrate about. Ambrose on the other hand own the former NXT Champion. He ended it quickly with a Dirty Deeds and the victory went to him. Of course I can’t help but wonder why Dean was facing Bo Dallas but I didn’t wonder for long as I didn’t care. The inspirational Bo Dallas, should just keep on Bo-lieving if he wants to do anything besides become a jobber. So far, Dallas is the only former NXT champion to NOT have much success on the main roster. i’m thinking it’s time for a change. Yet abother short and sweet match. Gotta figure there will be more to this fued to come. But Barrett owned R-Truth. The King showed why is the WWE’s one and only King as he won the match with a Royal Bull Hammer to a flying R-Truth. Guess we are keeping the spiders after all. Not much to say. It was a decent match, again nothing to really go one about. But that Bull Hammer, it was pretty. Ever get advice that seemed awesome but when put into practice it ends up blowing up in your face? That is what happened on Raw when the future of the industry and WWE World Heavyweight Champion asked for advice from his mentor, HHH. The advice: Call Out Brock Lesnar. This of course broke the 11th commandment. All men arrived in style. Rollins from the back wearing his title, and J & J Security driving up in their Cadillac. All eventually made their way to the ring, armed with ax handles. Seth called out the Beast and Brock answered. But this si where things began to go down hill. 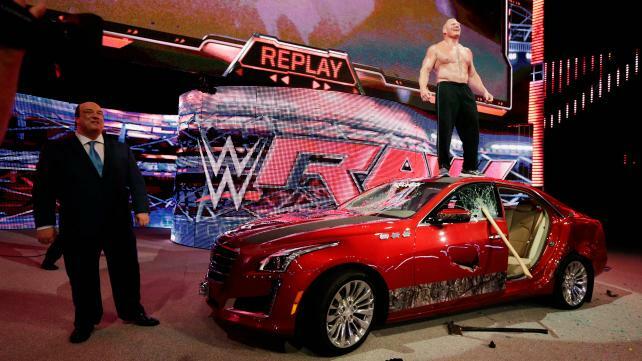 Instead of getting into the ring with the armed men, Lesnar made his way back to the car. Once there, Paul Heyman delivered a crate. In the crate, two fireman’s axes. He used the axes to destroy the caddy before ripping a door off of the hinges and flinging it into the crowd. Jamie and Joey rushed the Beast but Jamie suffered a broke arm and Joey suplexed into the windshield. The Beast then made his way to the ring where Rollins could only watch in disbelief. As Brock entered the ring, Seth high tailed it out of the arena with Lesnar hot on his heels. One has to wonder if Lesnar has anything against caddys. Or perhaps it was just that it was a J & J thing. I’d ask what they did to deserve such treatment, but it’s Brock Lesnar, one doesn’t need a reason to destroy another human being when your name is Brock Lesnar. People may dog on Seth for running, but he just finished watching The Beast destroy a car. Would you stay in the ring after seeing that?? No, I don’t thing so. After being destroyed by the Beast, Brock Lesnar, on the 4th of July in Tokyo, The New Day found itself in competition with the Lucha Dragons. It was a highly competitive bout with both teams getting in some good offense. But the high flying style of Kalisto and Sin Cara started to become a bit much for the clappers as the Luchadores flew around the ring hitting fast high impact moves. But it was Xavier Woods who made the difference. As Kalisto and Sin Cara dove from the ring to hit twin suicide dives, Woods pulled Kofi from danger and Big E caught Kalisto. 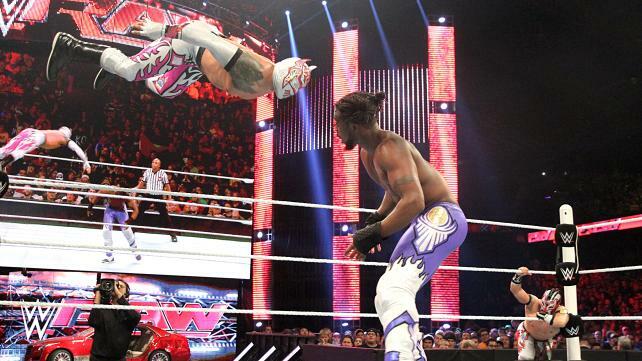 After dispatching the smaller wrestler, Sin Cara was put back in the ring and the Power of Positivity won out when Big E and Kingston hit the Midnight Hour to pick up the win. This match was fun to watch, but the Prime Time Players (who were doing commentary) really brought it together for me. What made me smile was Titus calling JBL out on his lack of commentary ability by calling the action better than the former champion. The match itself is exactly what the New Day needed to get back on track. They used everything at their disposal to secure the win and I see no reason why the same won’t be said at Battleground when they take on the Prime Time Players. Every now and again a match happens that you weren’t expecting. And it is one of the most epic matches that left the WW Universe on an emotonal high and put Cesaro back on the map as a true competitor on the roster. So whata happened was, United States Champion, John Cena came out to ssue his open challenge. Still stinging from his loss to Finn Balor at Beast in the East, former NXT Champion, Kevin Owens came out. He stated he no longer wanted to wait till Battleground. Buuut, This was not to be as the Swiss Superman came out demanded that the title opportunity be his considering his match last week had been ruin by Owens. KO ended up leaving and the WWE Universe was treated to an amazing match. Cesaro and John Cena are arguably two of the strongest men on the roster. Each one showcased their athletic ability and strength in more than one way. This match was filled with counters and reversals, submission holds, straight up powering out of submissions, near falls, and even flying about by both men. This match had no slow point and the energy of it had everyone on the edge of their seats. It did not matter who you were cheering for, you won by simply watching this match. Both men pulled out all the stops. Cesaro with a cork screw springboard European upper cut, and a second rope Neutralizer, he even brought the Crossface out in an attempt to win the United States title. Cena countered with his spring board stunner (which was countered) the Attitude Adjustment (which Cesaro kicked out of), and a plethora of other moves that could not put Cesaro down. But the Win did ultimately go to Cena as he hit the Attitude Adjustment once more and picked up the pin fall victory. After the battle, Owens rushed the ring and attempted to hit Cena with a pop up powerbomb. But The United States champion countered by jumping through it and then turning and delivering an AA to KO. There is not enough that can be said about this match. It was a spectacular show case of athletic ability and strength and what can happen when two men just have amazing chemistry in the ring. I will say that this match is going to be what puts Cesaro back on the radar. He is an amazingly talented man who consistently puts on great matches. He shown bright in this match and looked to have it in the bag. He took John Cena to the limit and nearly won a title. But of course it’s John Cena and one must battle his super power of kicking out at two. Though it would be a fun addition to the match at Battleground to make it a triple threat match, I don’t see it happening. It is the rubber match between Kevin Owens and Cena after all. As for Owens, poor guy lost to the Demon and now it appears that his confidence is a bit shaken. No worries, my boy will be good to go come Battleground and he will walk out United States Champion. This entry was posted on Wednesday, July 8th, 2015 at 8:47 am	and is filed under Events, News, Television. You can follow any responses to this entry through the RSS 2.0 feed. You can skip to the end and leave a response. Pinging is currently not allowed.